It was a day like many others. Linda and Tereza had hung out by the river, trying to find some comfort on such a hot and sticky afternoon. While walking home they witness the arrival of a police car at a local house. They're both caught by surprise when they see a girl approximately their own age, along with a baby, leaving the home. As far as anyone in Stony River knew, James Haggerty - or Crazy Haggerty as he was known by many - had lived alone. Of course, not many people ventured close enough to find out. I know that in my own neighbourhood growing up, there was a house that we all stayed away from and I think that is a universally shared experience. So begins the story of Stony River in an era that many view as safer and filled with innocence. As we follow the lives of the residents we are shown that even then, in the fifties, families were dysfunctional and for young girls coming of age, these were dangerous times. 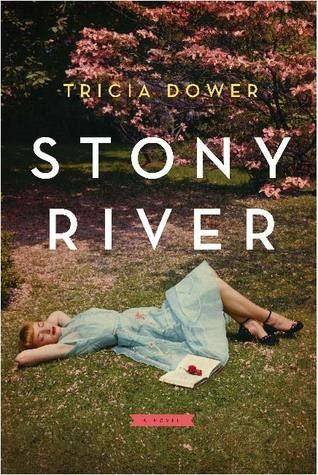 This book really captivates the reader from the very start and one could be forgiven for thinking that Stony River is going to be a light and breezy read, especially when connecting the first few pages with the enticingly idyllic cover. It isn't long though before the writing creates a different, darker picture and I found myself filled with a lot more questions than I had answers. That’s always a risk in a book as it’s a fine line between holding the reader’s attention and ultimately losing the reader due to frustration at the seemingly unending mystery. Tricia Dower pulls it off wonderfully though and I personally enjoyed it as even when I put the book down to tend to life; my mind was still active, trying to predict where the story was headed, without success I might add. That is always a sign of great storytelling as the author skilfully weaves a story that totally engages the reader. Ultimately when all was brought to light, I found myself stunned. Not so much at the twists (though they were great too!) but because the book had clues sprinkled throughout that I really ought to have been able to put together but hadn’t. That, to me, is another sign that the book was brilliantly crafted. One aspect I especially loved is the inclusion of alternative belief systems. In this case a pagan-based religion of Irish origin. I personally found myself fascinated by the natural, herbal healing mixtures and the creation of a garden that would hold a great deal of the ingredients needed. I also found myself enthralled by the religious conflict one of the characters experienced. I would be remiss if I failed to mention the abusive behaviours that sometimes arise within the pages, most specifically the subject of violence towards girls/women that is touched upon briefly throughout. For those of you who, like me, have experienced it first hand, it may cause brief discomfort or even mild triggering. In my own case it was strictly brief discomfort. The author tackled these subjects wonderfully and I highly recommend it. It’s easily one of my favourite reads this year so far. Thanks so much for reading and reviewing Stony River, Charlene. I'm glad you got so much out of it. Thank you, Tricia. I can't wait to see what you create next! This sounds good...thanks for sharing. Stopping by AGAIN from Carole's Books You Loved April Edition. I am in the list as #21.